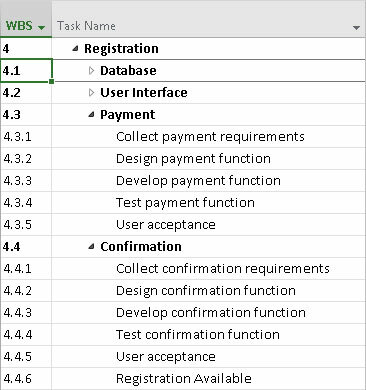 When you look at a project work breakdown structure in Project 2016, also known as WBS, or a project task list, such as the one shown in the following figure, you see that it organizes tasks into levels. The upper levels are from the WBS. The lower level consists of tasks that have been decomposed from the WBS. A task that has other tasks indented below it in this outline structure is a summary task, or parent task. The tasks indented below the summary task are subtasks, or child tasks. Summary tasks are indicated in bold in the Project outline. You can tell when a summary task has a family of subtasks clinging to its skirts: When a subtask is hidden, a little clear triangle is displayed to the left of the summary task. When you click the triangle with the tip of the pointer, the task expands to show its whole clan of subtasks, and the summary task adds a black triangle to its left. Project outline, showing summary tasks and subtasks. In the figure you can see that the summary tasks of Database and User Interface have hidden subtasks. The Payment and Confirmation summary tasks show all their subtasks. All information about a family of tasks is rolled up into its highest-level summary task. Therefore, any task with subtasks has no timing or cost information of its own: It gathers its total duration and cost from the sum of its parts. This roll-up functionality is cumulative: The lowest-level task rolls up to its parent, which might roll up into another summary task, which rolls up (for example) into a project summary task. Any task with tasks below it gets its duration and cost information from a roll-up of its subtasks, no matter how deeply nested it may be in the hierarchy. The structure of families in an outline is also useful when you need to reorganize an outline: When you move a summary task, all its subtasks come right along for the ride, regardless of whether it’s expanded! If a summary task is manually scheduled, the roll-up functionality doesn’t work, and Project displays warnings telling you so. The Gantt bar for the summary task has a red warning bar that shows you the calculated duration of the subtasks when they don’t match up with the summary task’s duration. The summary task’s Finish field entry also has a red, squiggly underline to indicate a potential scheduling problem. To deal with this situation, you can change the summary task to use auto-scheduling, in which case it calculates roll-up data correctly. If you want the summary task to continue to be manually scheduled, you can edit its finish date or use the Task Inspector to fix the summary task schedule. How many levels can you go in the WBS? You have no practical limit on how many levels of tasks you can create in an outline. Project enables you to indent to more levels of detail than you’ll need for all but the most complex schedules. Remember, though: At some point, you have to deal with assigning timing and resources to each of these tasks and then track their progress. Too much detail can make your project plan difficult to manage. For example, if your project is a few months long, you don’t want to track to a level where activities last only a few hours. Best practices suggest that you always set up your schedule to the level to which you want to manage your team — typically, business (working) days or weeks. For longer projects, you can schedule by using rolling wave planning, a method of progressively elaborating the amount of detail for near-term work and keep at a higher level any work that’s further out. For example, if you have a two-year project, you may have the first three months planned out in detail, the next three months at a higher level, and the remainder of the project schedule showing only milestones and key deliverables. As you progress through the project, you start to add more detail for six months and beyond. A good rule of thumb is to keep a good amount of detail for 90 days out. Rolling wave planning isn’t an excuse to add scope; it’s only the elaboration of existing scope. Just as a ship has only one captain, only one task summarizes all other tasks in a project. Display the project summary task, which represents the highest (least detailed) level of information and is often simply the title of the project, such as New Product Rollout. When you tell Project to display the project summary task, every task in the project falls under it in the outline, as shown here. In the Gantt Chart view, select the Gantt Chart Tools Format context tab. In the Show/Hide group, select the Project Summary Task check box. 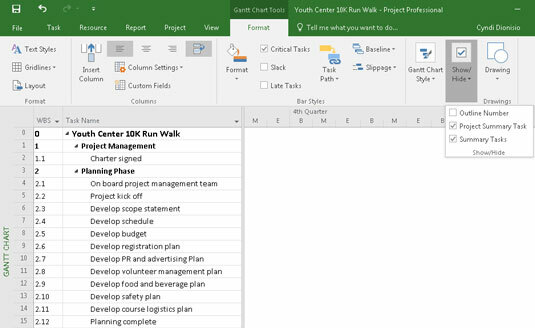 As you can see, Task 0, Youth Center 10K Run/Walk, is the project summary task. Notice that the bar for the project summary task on the chart is gray and that the bars for other summary tasks are black. When you think about it, an upper-level headline in an outline is the sum of its parts: The headline reflects the overall topic for all items below it. The project summary task advances this concept a step further: This task rolls up all actual data from other tasks into one line item. Thus, the project summary task’s duration reflects the duration of the entire project. From a monetary angle, the project summary task’s total cost reflects the total costs for the entire project. Figures such as these can be handy to have at your fingertips — and that’s one value of a summary task. If you’re confused about the length of your summary task, remember that the summary task duration is the difference between the earliest task start date and latest task end date. However, nonworking days aren’t counted in the summary task duration. The length of the summary task, therefore, equals the number of days of work over the course of the subtasks, not the number of calendar days between the start of the first task and end of the last. You can quickly view totals for the project at a glance in the columns of data in Gantt Chart view and other views. You can place a link to your project summary task in another project so that all data for one project is reflected in another. For example, if you create five schedules for new product launches in your company, you can easily create a master schedule for all company product launches by linking to the project summary tasks in each of the projects.